I’ve never been very good at it … I don’t even like seeing friends leave after a party, it’s even hard to separate after a weekend with my buddies, but there are some ‘goodbyes’ that don’t even compare. It hurts watching someone you love start packing for a journey really far away, like our daughter and son-in-law moving back to Germany…saying ‘goodbye for now’ raises the bar to a new level. But then, when I think of our precious mentor and friend, Katie, we lost here on earth just this past week, and how her husband of over 60 years had to say ‘goodbye’, there is just no comparison. In this case, my prayer is a simple one…that God will wrap His huge, loving, gentle arms around Dean, assuring him that his sweet wife, Katie, is free from cancer, free from pain and will be waiting for him. 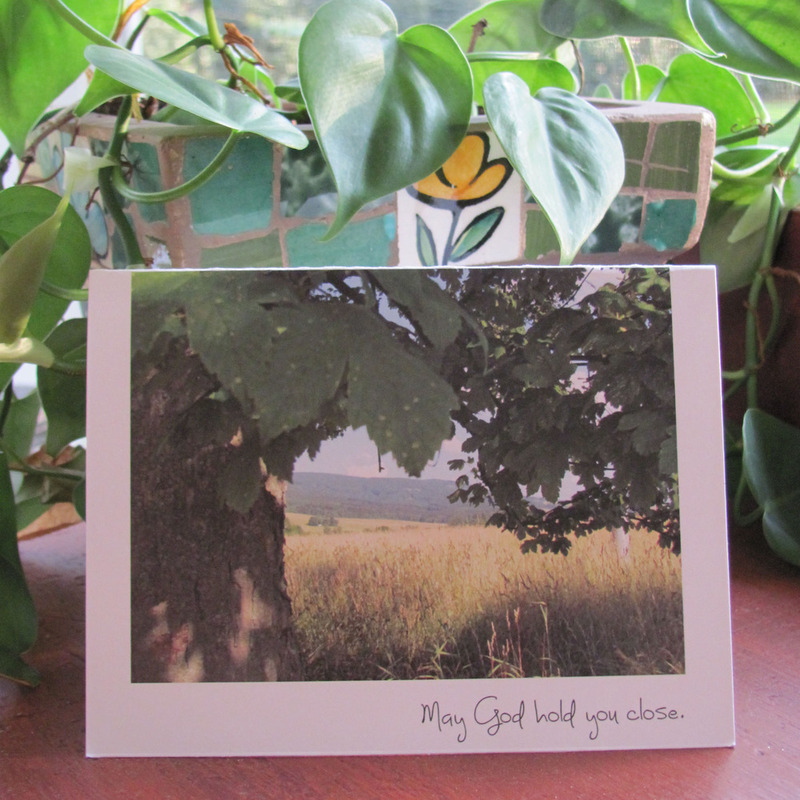 I will be giving Dean the card ‘May God hold you close…Praying for you.’ It’s a simple one…but sometimes just a few important words are all that needs to be said. This entry was posted in Uncategorized on August 20, 2015 by Tana Harper. This entry was posted in Uncategorized on August 3, 2015 by Tana Harper. Are any of you getting to the point where you need your GLASSES to read just about anythng, like me? You know, like when you’re trying to read that special sale price that you thought for sure said 75% off, but when you get to the register is turns out it’s only 25%? Dang. Should’ve gotten the glasses out. Or when trying to read the protein or calcium amount of my latest food attempt to be younger, stronger, smarter or energetic. I think you get the picture…as frustrating as remembering to put my glasses on is for me, I can’t imagine what it is like to not even have a pair available. My friend, Mary, after going for many years in a blurry world finally broke down a few years ago and got glasses….she was amazed that the leaves on the trees were more than just something from an impressionist’s painting. Her vision of the world changed dramatically. Go figure. Giving others the opportunity for better sight is an exciting goal for Cutie and Noodle Card Company. Better sight comes with better opportunities…whether on a mission field or in a classroom… in a third world country or in our nearest school, the challenge of education becomes much more difficult for those who can’t even see the letters clearly on a page in front of them. So this is a simple way we can help…providing glasses for those in need, young or old…wherever we find them. So a portion of proceeds from the Vision Project line of cards will go for this endeavor. The cool thing too is that we will be using artwork, photographs and drawings donated from others who embrace this idea and have a vision they want to share with the world. I love our first card …to me it embraces the idea of looking forward to a future with hope...here’s wishing that for all of us! Peek here. This entry was posted in Uncategorized and tagged glasses, vision on August 22, 2014 by Tana Harper. This poignant little card pictures a father and daughter of a really amazing family that we know. This family has two blond-headed little gals, as well as two little guys they have adopted from Haiti. As he tosses their youngest daughter in the air, I just can’t help but think of the wonderful fathers in this world who have given their daughters wings…wings to graduate, wings to try new adventures, wings to start their own families, wings with confidence to become whoever they want to be. Let’s celebrate the cool dads of the world…that connection with their daughters is priceless!! Peek here. This entry was posted in Uncategorized on June 6, 2014 by Tana Harper. Dads are hard to celebrate sometimes…it seems as though they don’t want anything, or they want something really big that is out of our price range. (Did someone say Mazerati?) With Father’s Day coming up, we have some simple solutions if you are stumped! We even have one for someone who is ‘like a father’ to you. ‘Every father should remember that one day his son will follow his example instead of his advice.” Inside it reads ‘some dads get them both right…like you!’ Get a little fishing gear, a new tackle box or a day fishing, or just his favorite snack might be the ticket. Peek here. Another idea is ‘You make even the ordinary fun!’ Peek here. Pop by the grocery and get him his favorite decadent snack, then sit together and talk about fun memories! We are so excited about launching our new website and we would like to offer our visitors a ‘buy 2 get 1 free’ offer using the coupon code ‘woohoo’. Offer good through June. Try us out and make our day! This entry was posted in Uncategorized and tagged coupon, father's day on June 6, 2014 by Tana Harper. It’s so nice to be able to offer free shipping to our retail customers! So, no matter how many cards you purchase, shipping is free. And who knows, now and then we even add an extra card or some other little surprise…not always, but probably when you least expect it! Don’t you just love surprises! This entry was posted in Uncategorized on May 21, 2014 by Tana Harper. Team Cutie and Noodle…small but mighty! It was a fabulous and moving day when Cutie and Noodle had a team that ran (ok…and walked) in the Miles for Moffitt Cancer Run a few weeks ago. See our team on our Cutie and Noodle Facebook. To come together with some of my oldest (longest that is! ), dearest friends and family to join over 7,000 people who participated, each with their own stirring story …maybe about their own experience, or that of a loved one… was an amazing experience. What a privilege to be a part of this event, and for Cutie and Noodle to be able to donate $200. Our team raised $860, thanks to wonderful folks who made contributions to this important cause. It’s nice to know that all the donations go directly to research at Moffitt Cancer Center. Oh, and hey, did I mention that one of our team members actually placed third in the 8K…was that Ben Prueser?…or Whitney? ‘Guess we’ll never know…but congrats to both of you…and what a sweet experience to have Whitney join me in the finish of the 5K. Blessed for sure. We LOVE giving back a percentage of what we make at Cutie and Noodle Card Company. It’s an opportunity and a privilege, and a way to say ‘thanks’ for how we are blessed. A recent donation went to an organization called Autism Speaks. Learning that autism among children has risen dramatically in the last ten years, through research and education, their hope is to change the rising trend. One of our cards we call ‘Sophie’ features a precious, wide-eyed little girl who has autism. Peek here It’s in her honor that we have made this donation. This entry was posted in Uncategorized and tagged autism, birthday, sophie on March 27, 2014 by Tana Harper. This entry was posted in Uncategorized and tagged Denmark beach, new website, North Sea, starfish, treasures, welcome on February 18, 2014 by Tana Harper.